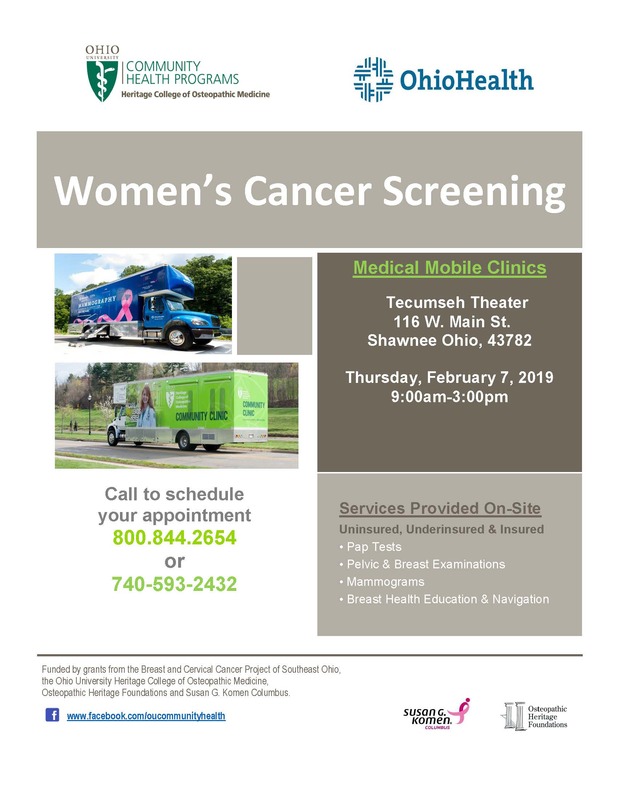 The Ohio University Heritage College of Osteopathic Medicine Community Health Programs in collaboration with OhioHealth Mobile Mammography will be holding a Women's Cancer Screening Clinic on Thursday, February 7, 2019 from 9:00 a.m. to 3:00 p.m. at the Tecumseh Theater - Shawnee, Ohio. Through its Breast Education Screening & Navigation Program, the Ohio University Heritage College of Osteopathic Medicine Community Health Programs (CHP) has long provided mobile women’s cancer screening clinics around southeastern Ohio as part of its mission to improve women’s health in the region. In collaboration with OhioHealth Mobile Mammography, the Heritage College CHP will also offer same-day mammography at the Perry Co. (Shawnee) mobile clinic. The next mobile clinic is, Thursday, February 7, 2019 from 9 a.m. to 3 p.m. at Tecumseh Theater 114 W. Man St. Shawnee. Services are available to all women, uninsured, underinsured or insured. Appointments are required and women should call 740-593-2432 or 1-800-844-2654. Services offered through CHP mobile clinics include breast health education, PAP tests, breast and pelvic exams, same-day mammograms, navigation through the continuum of care & Susan G. Komen Columbus® grant funding for financial support for mammograms. In addition to the mobile clinics, clinics are held at the college’s Heritage Community Clinic on the Ohio University Athens campus. The most current dates, times and locations for upcoming clinics to area counties are located on the CHP online events calendar - https://www.ohio.edu/medicine/community-health/community-clinic/calendar.cfm, or call 740.593.2432 or 800.844.2654.